just a quickie. Hope it speaks for itself. It's pretty awesome, because it means that I can make interesting plots without an hour-long copy and paste job. Just ask if you feel like looking at a certain aspect of the data. Back to Morey ball: Morey ball tells us that it makes sense to shot only from the rim or from behind the three point line if possible (sounds intuitive? Ask Byron Scott). 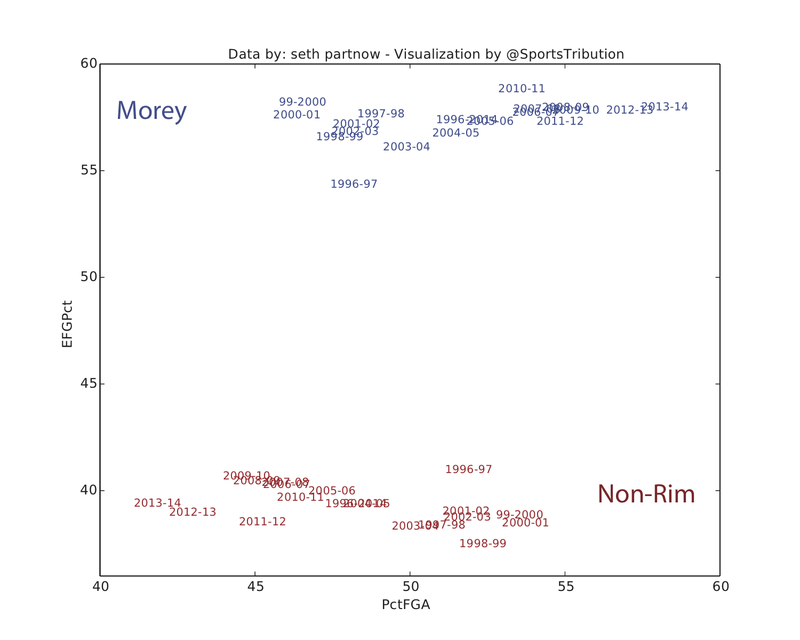 Interestingly, there is even a positive correlation for the Morey Ball shots (more shots from 3 or rim means higher effective field goal percentage from there) and a negative correlation for midrange shots (more shots from midrange means lower effective field goal percentage from there). Both with a small but existent correlation of around 0.4 (or -0.4).